Notorious fascist thug Tommy Robinson (real name Stephen Yaxley Lennon), will be opposed by Stand Up To Racism and Unite Against Fascism at the BBC’s Media City, where he and his supporters plan a demonstration on Saturday February 23rd. The former British National Party (BNP) member and ex leader of the English Defence League (EDL) will be protesting against a Panorama expose of his racism, islamophobia and violence. So much for his talk of “press freedom”. Yaxley Lennon, still to appear at the Old Bailey on contempt of court charges, is a serial instigator and organiser of anti-muslim hatred. He is also a convicted fraudster. He recently targeted the family of a Syrian, child refugee, subjecting them to all manner of intimidation. Anti fascists crowd funded to ensure that the family can sue Robinson. As EDL co founder, Robinson led provocative marches into areas with large Muslim populations. He warned Muslims they would feel the “full force” of the EDL. It took mass counter mobilisations led by Unite Against Fascism and others in areas like Tower Hamlets and Walthamstow in East London, to check the growth of the EDL. Robinson is more of an extremist than ever, continuing to promote scapegoating of muslims. For all his talk of exposing “Asian grooming” he tolerated known child abusers in the EDL, such as Richard Price in Birmingham. Recently, Robinson has headed up ‘Free speech’ demonstrations in partnership with UKIP’s leader Gerard Batten. There were also a series of far right supported “free Tommy” protests following his imprisonment for contempt of court. These ended with violent attacks on anti-racists, trade unionists and police. Robinson has received support from international far right figures such as Dutch Islamophobic politician Geert Wilders and ex Trump chief of staff Steve Bannon. He has been extensively funded by US Islamophobic think tank, the Middle East forum. Robinson’s hate rally follows a number of ‘yellow vests’ protest in the city and elsewhere (see below). 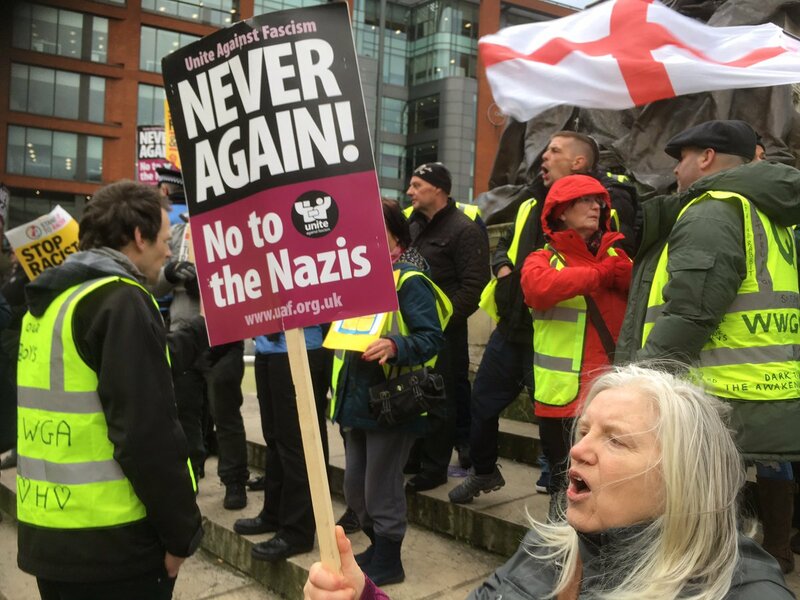 Anti fascists organised a counter-mobilisation against a “Yellow Vest” protest on Saturday. UAF regional organiser Paul Jenkins said,“We had over 100 people across the day, including Labour Party members, trade unionists and campaigners. People stopped the fascists from holding their hate rally in the city centre today. The fascists thought that they could try and intimidate picket lines and anti racist stalls – but they were frustrated by our demonstration. Among those present were Councillor Rabnawaz Akbar; Trafford Trades Council members of NEU and UCU union and GMB members”. The “Yellow Vests” harassed an RMT rail workers’ union picket last month. They have tried to disrupt and intimidate SUTR and socialist campaigning stalls in Manchester. Robinson has been quiet recently and this is his first demonstration, since last December. The British far right were going forward last year. Several thousands-strong rallies in Whitehall brought together forces, from open nazis to UKIP. A 10,000-strong anti-fascist demonstration outnumbered the December march led by Robinson and Ukip. Recently Robinson’s plans to fill his pockets by touring America and Australia were curtailed after he was denied entry into the countries. Robinson now sees the Manchester rally opportunity to again assume a key leadership role, in the movement. Goddard’s protests have been small, but they show that fascists are still confident on the streets. The menace of the far right remains. In London, yellow vests from the far right traipsed around Whitehall again this Saturday but with no seeming direction. 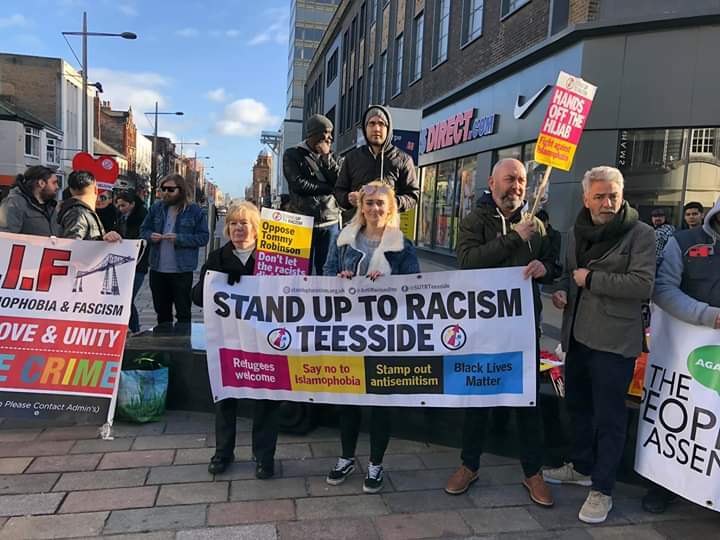 In Middlesbrough, less than thirty fascists tried to organise a march in the town but were hampered by anti fascists. Noisy, violent and voluntarist, the yellow vests of the far right have not broken through. This partly explains their provocative tactics but their inertia reflects the fact that Robinson is the figure that can unite the far right, for now. However, there are fatal flaws which have brought down Robinson before and can again. These are a mix of his vast ego which leads to ill fated efforts previously eg PEGIDA UK. An Old Bailey appearance for most people would see moderate behaviour exercised. Robinson is clearly intent on more street activities such as in his EDL days. Lastly, there are the subjective forces of broad and deep anti fascist and anti racist organisation, which have seen off Robinson’s past incarnations and can do so again. Robinson’s rally in Manchester is attracting groups from across the far right, eg Generation Identity and the so called Democratic Football Lads Alliance. Government attacks on Muslims, migrants and refugees provide fertile ground for their ideas and help them grow. Anti-fascists must take to the streets to oppose Robinson and his thugs. Protests in London, Glasgow and Cardiff on 16 March, on UN anti racism day, are a key opportunity to push back the far right. Weyman Bennett – UAF joint secretary said, ” Journalism that lifts the lid on Robinson, his funding and his violent racism is welcome. We should not allow the fascist Tommy Robinson to be “normalised”. He’s not a journalist or an “activist”. he is a far right thug who looks to rip up our diverse society and promote dangerous divisions within it. It is important we stand together and defend our democracy against the far right”.